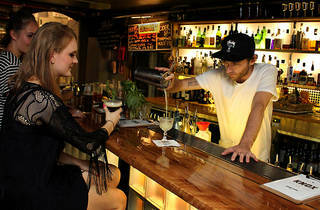 Our bartender tells us that the Knox Street Bar is meant to be a local take on a Scandinavian underground bar. We don’t spot any brooding Wallander-esque dudes or hear death metal on our visit, but the Scandidog hot dog and a full complement of akvavit (Scandinavian schnapps) on the menu – not to mention the Nordic pedigree and name of owner Bjørn Godwin – certainly supports the theme. Happily, Knox Street Bar narrowly – yet successfully – escapes becoming a caricature. The raw, dimly-lit, industrial space peppered with scavenged objects supplys the edginess, and bric-a-brac like fairy lights, a truck grill embedded under the kitchen window (as a shticky symbolic food truck), and a rainbow-coloured cocktail wheel provide the enjoyably kitsch elements. They’re very proud of their hot dogs here, and rightly so. They’re made from a Godwin family recipe with free-range, Victorian pork and finished with Nordic toppings like mayo, sour cream, friend shallots, pickled cucumbers, dill, mustard and apple sauce. They are served from the kitchen by an amiable, attentive bartender with a welcome swiftness – she even brings the drinks directly to our table. Want hot salty snacks to balance out a night on the tiles? Generous portions of satisfyingly truffled fries with aioli are a good shout, as is airy tempura onion rings that arrive mouth-scaldingly hot. Bafflingly, the olives also arrive piping hot – one to avoid next time. Most of the menu is hygge (cosy) food that’ll line your stomach while you drink mug after $8 mug of well-curated craft brews from Batch, Dos Blockos, 2 Birds and Willie Smith’s. There's a dozen or so signature cocktails, but if you can’t decide which to order, spin the cocktail wheel and pay $16 for the drink you land on, like the refreshing, ginger-spiked, rum-based Knox Street. For four dollars more get a smooth, barrel-aged Negroni or Manhattan. One of the special cocktails, the Mezzy Margarita ($20), is a dud – more resinous than smoky and impossible to finish ­– and we’ll pass on the wine next time. Different nights bring in different crowds – it depends on if they open the back room up for gigs. Although the room skews young, the people who show up for the bar’s comedy and story-telling nights are old enough that they don’t cringe at spending $20 a cocktail. 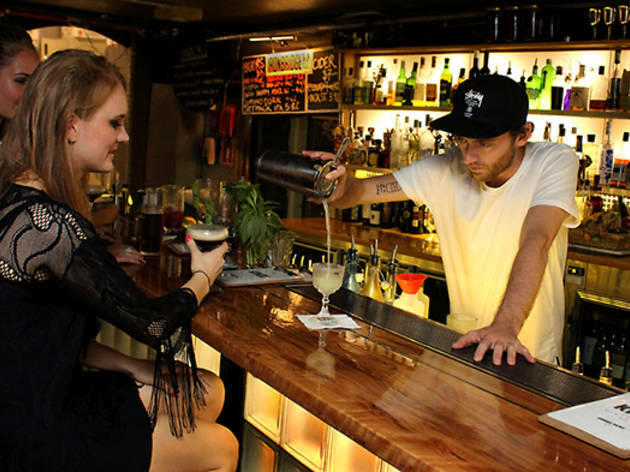 The Knox Street Bar is still thriving after two years in the Chippendale backstreets. It’s a solid choice as the opening salvo to a big night out or as the mid-point of a weekend bar crawl. But if your group lands the cave-like room set a few steps down from the bar, you could very well end up here all evening.